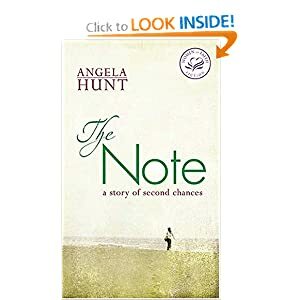 This is my first experience with Angela Hunt, and it certainly won’t be my last. She brought me right into the life and concerns of a newspaper writer, taking Peyton MacGruder’s mundane life through a series of events that kept me reading until late at night. (Not easy for a mother of two toddlers!) Peyton’s column, The Heart Healer, does not suit her formulaic, impersonal style at all, until she is given a note supposedly written on a jet seconds before it exploded in mid-air. In her search for the intended recipient of this note, Peyton begins to care about the people she interviews and writes for, and allows her emotions to flow once again through her heart and her words. The Heart Healer has some definite healing of her own to do. Hunt develops a full, realistic character in Peyton MacGruder, one that I enjoyed watching grow and change. Julie St. Claire, the “villain,” remains quite shallow, and that’s okay; I can see a whole other story to be written about her. Hunt has a curious tactic of adding “Comment by …(other characters)” throughout the novel, which I thought wasn’t necessary as it isn’t a first-person perspective, but it didn’t really harm the flow of the story. Other than that, I thoroughly enjoyed the story and I’ll look for more of her work. I didn’t get the Christ-centered message until I read the author’s note at the end, and then I was hit by the hidden thread of it all the way through. I challenge you to read the book and find it for yourself.